When I first started cycling I used to carry all my stuff in a small backpack. That was OK for a while, but then the amount of stuff I needed to fit in it just seemed to keep growing. I have – to use the proper medical terminology – a dodgy left shoulder, the result of an RSI incurred while shifting books in the university library when I was a student. Carrying my over-full backpack around with me, not only on the bike but off it, was getting increasingly painful. Pannier bags seemed like the obvious solution. I would’ve got them a lot sooner than I did, but I was worried they’d either slow me down or maker it harder to manoeuvre through the traffic. As it turned out, they did – but only a little, and that’s probably no bad thing. Once I’d got used to my centre of gravity having shifted back a bit, I was fine. In fact, I’ve got so used to my bag-come-ballast that, when I rode without it recently for the first time in ages, I wobbled all over the place. 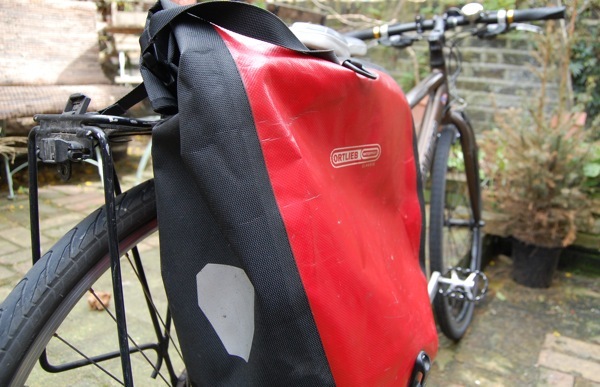 My pannier bag – a shiny red Ortlieb – is perfect for my commute. It’s big enough for all my stuff, it’s sturdy, it’s waterproof and it’s practical: it can withstand whatever gets thrown at it during the ride. And for the rest of the day it just sits under my desk, out of the way. But it’s not so perfect when I’m out for the day, or the evening. It’s awkward to carry round; it’s always banging against my legs, other people and pieces of furniture. It doesn’t fit easily under a bar stool or a theatre seat. It’s not stylish or feminine. In short, it’s not the bag I would choose to carry round with me if I weren’t on my bike. I have tried a different bag. I was, for a time, the proud owner of a Basil shopper. Although still not perfect – it still looked more like a bike bag than an ordinary handbag – it was a definite improvement. But what it gained in style, it lacked in robustness: the hooks to fasten it onto my pannier rack came off after just a few months of use. So what else can I do? Despite my experience with the Basil bag, I’m still contemplating a pretty bike bag. I’ve recently discovered the New Looxs brand, and some of their bags are very tempting indeed. However, they’re also quite expensive: £50 is a lot of money to spend on a bag that may prove to be as flimsy as my Basil bag. The other alternative, of course, is to just use the bag I would have with me if I weren’t on my bike, and then work out a way of carrying it on my bike. I don’t think a front basket would quite go with my bike – nor can I see how I would fit it on – but a rear basket might. There’s also the bungee cord option, although I would be a little worried about the bag coming off. So anyway, I thought I’d throw the question out there. How do you carry your stuff around when you’re on your bike – backpack, pannier or basket? What else have you tried? What works, and what doesn’t? So I use a Ortleib Velocity Rucksack which is big (20L capacity) and very comfortable to ride with. It is designed to keep airflow around your back so no sweaty back syndrome for me! I also have a Cyclodelic handlebar bag, which is waterproof, well made and looks pretty. I use that to keep my phone, wallet and other small bits in – and it comes off the bike with me during the day so I have a handbag. I must say, I love Ortleib panniers and rucksacks, despite their looks. They are supremely functional and well made – but I do appreciate they are not a bag to be seen with off the bike. I would say with New Looxs that £50 seems reasonable for a bag if it is well made….and they do look very nice too. If you can try and seek out some reviews about their bags then do try as I think they could be a viable option for your stylish bag! Thanks for stopping by and for commenting. I agree, Ortlieb panniers are fantastic, and – in terms of functionality – I have no complaints. They’ve been fantastic during all the horrible weather we’ve had over the winter. I’ve just got back from a weekend in Copenhagen, and noticed that almost no-one used a pannier bag. Most people had baskets, either front or rear which they used for their bags, shopping, and everything else they needed to carry. I’m totally sold on the idea now – I just wish i could buy their cycling culture along with the basket! I have a large-ish backpack with a mesh panel that keeps the bag away from your back – great for taking lots of stuff to & from work. When not working, I quite like a small backpack I’ve just bought. I’ve only used a panier once and that was on a cycle tour. I’ve seen those before, and yes, they do look lovely. How are they in the rain? My bag may not be the prettiest ever, but I know I can rely on it to keep my stuff dry. Not sure yet, I haven’t been out in the rain! hello! I have the bobbin panniers as well (they match my bobbin bike) – they’re great in the rain – have ridden through some pretty heavy London weather with my laptop safely inside. They are also really roomy and so make the perfect bag for collecting the shopping. The REAL problem with them is that they don’t have a shoulder strap – just handles – which makes them hard to carry around if you’re out for the evening, and also hard to carry when they’re full. Also just read your entry on cycling in skirts – love it – I do it every day. I don’t care what other ‘serious’ cyclists think – I feel stylish and it looks better than lycra!. Loving the blog – keep it up! I use the Union 34 seat post bag. Its perfect! Fits in all my stuff, and a laptop. Its waterproof. It looks lovely, rather laptop bag/rucksack. The downside is that you’re looking at £100. Well worth it for me though. Five years of cycling with a rucksack attached to my shoulders has taken its toll. Hey Jude! (I’ve always wanted to say that to someone else :-)) Thanks for stopping by and for commenting. I’ve saw a review of the Union 34 seat bag recently and thought it sounded pretty good. The only problem for me is that I have my seat pretty low and don’t think I’d have enough seat post to attach it to. Annie – thanks for stopping by and commenting. Glad you like the blog! I prefer bags I can carry over my shoulder as well. I’ve also been stalking the Cycle Chic website, and some of the bags they have are very tempting indeed…I like the idea of having a pannier bag that doesn’t look like a bike bag at all. I got a great bag from Good Ordering. I was one of their kickstarters and got the market shopper which I absolutely love. Am seriously considering getting one of their handlebar bags now too. http://goodordering.myshopify.com/ They also don’t seem as expensive as other bags that I’ve seen around too. Hi there! I too am an Ortlieb fan but with my daughter starting secondary school soon I knew that lugging bike panniers around school on her person (occasionally wet panniers too) would not be comfortable or aesthetically pleasing for a teenager. Enter Clarijs panniers. Made in Holland, available off the shelf or customised, they stay on your bike (they have a hole to lock them to your rack) and you put your stylish bag inside where it stays dry and clean. My daughter has had hers for a few weeks and loves them. They are functional looking but that’s what I love about them, they should last and last! after a mere 15 years or so of cycling in London I have cracked it; dutch panniers. They stay on the bike and I put my nice functional, pretty whatever bag INSIDE. My dutch panniers haven’t been nicked, because, like my bike, they’re a bit beaten up and dirty but they keep my bag/shopping dry and clean and I don’t have to cart them around with me all day. Wish I’d got them years ago. I’m with Jo. I have a functional, grey Altura pannier that I cable lock onto the pannier rack,then put my nice handbag in that when I’m going out for the night and don’t want to look like a total nerd carrying a pannier around with me.